In developing our company devoted to better end-of-life, death and dying, we have at times come up with ideas for gear that could preserve life. Recently, we decided to act on these inclinations to design a life-sustaining product we hope to be the first of a series of emergency response products inspired by events in the Pacific Northwest. The LIFE PACK, is our first attempt at life preservation and was inspired by Oregon’s Taki Too Disaster. The following is a brief summary of the tragedy and our concept in development. 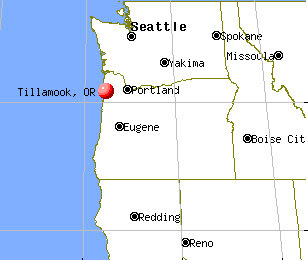 On June 14, 2003, 11 of 17 passengers died when they were cast overboard in Tillamook, Oregon. The Taki Too was a small passenger vessel that capsized just offshore. There were plenty of life vests stored in the ships cabin. The captain offered the passengers life vests before the voyage, and instructed them in their use, but the passengers declined. When their ship capsized, the majority of passengers were unable to reach the vests in time. Please note: in this disaster, drowning didn’t cause death, it was actually hypothermia and shock of the cold Pacific Northwest ocean temperature. People who can swim generally believe they are good swimmers. 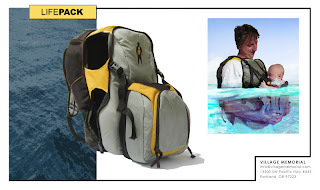 People usually find life jackets to be bulky, inconvenient, and uncomfortable. Although recommended, the Coast Guard does not monitor the wearing of a life jacket. Even with floatation gear, when a person who is not prepared falls into cold water (temperatures of 52 degrees or less) the shock of the cold alone can be fatal. Cold shock trauma can induce large gasps, hyperventilation, rapid heartbeat, and increased blood pressure. Most people who die of hypothermia do so in the first few minutes from failure to breathe or to sustain their heart. Even when a passenger manages to survive the first two or three minutes in cold water, they will have to contend with the opposite effect of their heart slowing down and eventually stopping altogether. In emergency situations, there is little time to think if any at all and therefore any delay in response time can be lethal. 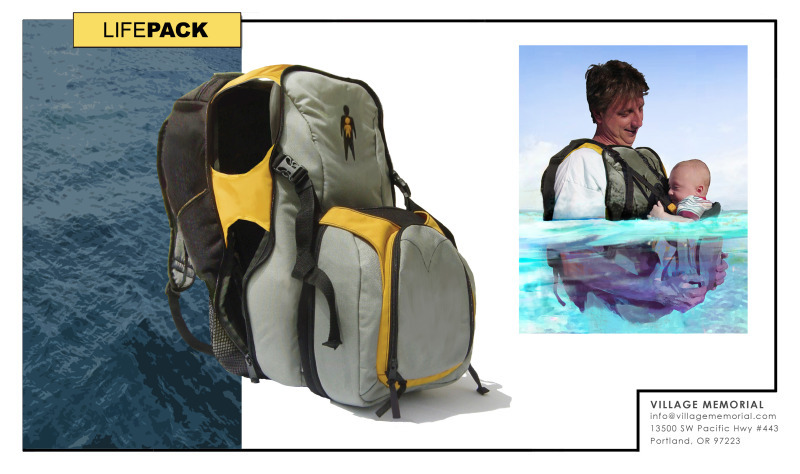 This is why Village Memorial has developed The LIFE PACK, a first of its kind dual bag floatation device incorporating an inner thermal lined compartment, which holds a heat generating super-corrosion sleeve. (This slim lightweight disposable Magnesium particle impregnated sleeve is also currently used in flameless ration heaters (FRH).) This heat-generating element creates an exothermic reaction, which allows its wearer to maintain homeostasis for several minutes even in dangerously cold water. This is intended to give emergency responders additional valuable response time in a marine rescue. In just 12 minutes the standard FRH sleeve’s temperature can reach 60 degrees Celsius (enough heat to bring a liter of water to a boil). Heat is generated because the FRH contains magnesium metal impregnated material that when mixed with salt water, forms magnesium hydroxide, and hydrogen initiating the giving off of excess energy. 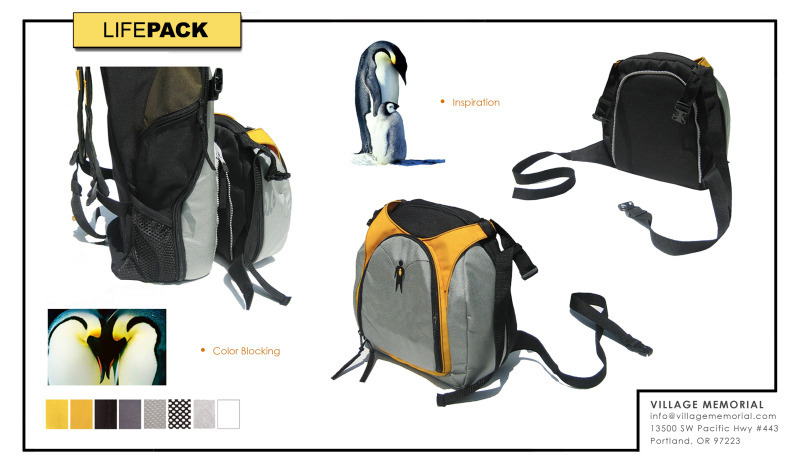 The LIFE PACK is a bag that is always with you whether or not you need a life saving device. To protect passengers from unexpected circumstances, we must design emergency gear for redundancy of purpose. 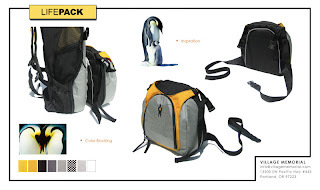 It has to be fun to use and sporty in appearance, which is why we chose Emperor Penguins as our inspiration for staying warm in icy water. The most important thing we can do is develop products that people want to have with them that also function as a life saving device. Statistically, most adults put life jackets on children but not on themselves. This inspired us to design it so the wearer can hold a child hands free in water. American Astronaut, Neil Armstrong, has died at age 82. He was the first person to step foot on the surface of the moon on July 20, 1969. Armstrong had a student’s pilot license before he could even drive. He served as a US Navy Officer in the Korean War. He led the Apollo 11 spaceflight as mission commander. He graduated from Purdue University with a BS in Aeronautical Engineering. He earned a Master of Science degree in engineering from USC. He also taught Aeronautical Engineering at the University of Cincinnati. He was awarded the Presidential Medal of Freedom, a Congressional Space Medal of Honor, a Congressional Gold Medal, and a Langley Gold Medal. 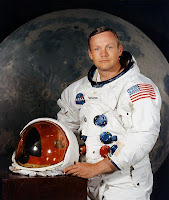 Neil Armstrong’s first words after landing on the moon would be come part of the American lexicon: “"That's one small step for man, one giant leap for mankind." Health is so vital to aging well. The good news is that we have a lot of say in how we age. We can choose to make decisions that affect us positively or negatively. Many things are within our power to change. Other things simply require making good decisions to keep us healthy. It’s wonderful to know that at any age we can decide to live healthier, and it still has a positive impact on our future health. As I look at my own health, I know there are many habits I can change for the better. An amateur nutritionist for many years, I have held a passionate interest in the food we eat and keeping fit and healthy. I’ve been known to experiment with diet fads, like Slim Fast, the South Beach Diet and the Atkins’ Diet. (Interestingly, a Naturopathic Doctor recently told me that the Atkins’ diet is the single best diet because of the low carbohydrates and high protein regiment.) However, even trying Atkins’ Diet alone didn’t make me feel healthier or fitter. I actually felt better when I combined elements of several diet types such as low carbohydrates, low fat, smaller portions and high fruit and vegetables. What I have learned is that there are general guidelines to eating well and the rest is somewhat variable and tailored to each individual. There is no one size fits all. A diet needs to become a lifestyle one can maintain. My fitness over the last 5 years has changed a great deal. Life events, major relocations, college, family deaths and life stress have definitely affected my ability and drive to exercise and eat well. In 2007 I weighed 117 lbs. I was eating well, exercising regularly, and felt great. Now in 2012 I am 25 lbs. heavier, nothing fits, I no longer feel good about myself, and I am generally uncomfortable more often than not. Hence, I am determined to t get back to an exercise plan, because I want to feel good again. People often tell me “Oh you look fine, you don’t need to lose weight” and for me it isn’t about outside opinions. It’s about feeling good. When you eat poor and stop exercising, your digestion is also affected. I now feel sick more often than I feel well. I’m also beginning to have migraine headaches again. Truly, the things that are good for you like, watching your weight, exercising, and eating healthy foods are not only healthier for you, but they make you feel better in so many ways. I am glad to know that what’s healthier for you also leads to better health as you progress through the life course. As you age, healthy habits go a long way. I presently am without health insurance, and purchasing private coverage is not cheap. I have access to some health coverage. Firstly, I have two friends that are Naturopathic Doctors who have been able to prescribe medicines when I need them, provide me supplements at wholesale, consult me on various health issues and provide nutritional advice. For allopathic medical care, there is a wonderful community clinic called, Wallace Medical Group that runs off donations. All the doctors there are volunteers that work days somewhere and donate time in the evenings at the community clinic. They also connected me with a Rosewood Family Health clinic, which operates at a discount based on each patient’s annual income. For families eligible, they offer a maximum discount of 75% off services. As a student, this has been a lifesaver. Walgreen’s offers a $20 annual membership to get discounted prescriptions. Fred Meyer has a special list of the most frequently ordered medicines that they offer for $4 a refill. The State of Oregon offers a free prescription discount card just for signing up online through their website. The cost to the patient is merely the time it takes to fill out the card. The discounts are as much as 40% off retail. I personally have used both Walgreen’s and Fred Meyer’s pharmacies and have been very relieved with the savings. My family history has some longevity on my mother’s side. My grandmother died 2 months ago at age 87 and my grandfather died last week at age 90. My father’s parents both died at 78. The diseases in the family include cataracts, Alzheimer’s, type 2 diabetes, high cholesterol, colon cancer, skin cancer, cardiovascular issues and likely more I’m not aware of. Based on my family disease history, I know I have a risk of type 2 diabetes, high cholesterol, stroke and even cancer. I know that these three are highly diet-based diseases. (Perhaps this has fueled my interest in dietary habits.) We also know that caloric restriction also helps contribute to longevity. “The only intervention proven to extend life expectancy, prevent and reduce many age-related diseases, and maintain physiological function in animals is caloric restriction”. Physically as I age, firstly, I don’t expect to get skin cancer like my grandfather had or have the same intensity of wrinkles as my grandmother. My grandmother smoked, and I do not. My grandfather spent excessive time in the sunshine without protection, and I do not. Early on I found that the sun caused me painful sunburns within in a very short time. In fact, my father was once hospitalized for sun poisoning. In addition to burns, exposure to the sun makes me sleepy and lethargic. I have since gotten used to covering up from the sun, with a combination of sun block or sunscreen, a hat, sunglasses, gloves and long sleeves. I have recently added a hijab (a Muslim women’s veil) to my sun protection attire, and although this grants me unwelcome attention, it is essential to preventing sun exposure to the sides of the face, ears and neck during driving. Thus, I plan to avoid the skin cancers and wrinkles that come from sun exposure because “the degree of skin degeneration is directly related to the amount of sun exposure”. Plus, we learned that physical sun protection is the safest way to enjoy the sun. Although bone loss in not in my family health history, bone loss is something I believe will be at risk of. I switched from drinking skim milk to soymilk for several years. Although I have recently switched back to 1% milk, during my soymilk phase, I did not entirely replace all the calcium and vitamin D I was losing. Plus, I have had plenty of carbonated sodas since childhood and “A diet low in calcium and vitamin D and high in phosphorus (found in meat and sodas containing phosphates) is correlated with reduced bone mass”. Thus, the factors above added with the fact that I stopped exercising are sure fire risks for bone loss. Hearing loss is not something that was common in my family, but is something I am concerned about as I attended many rock music concerts through the years. I now know that “researchers believe hearing deficits are attributable more to an accumulation of noise damage than to actual age changes”. There is so much I can do to maintain and improve my health that I feel hopeful. I have many ideas and plans and most are simple to implement. Preventing bone loss will be easy with “sufficient calcium, vitamin D and regular weight-bearing physical activity” as these are “the most effective ways to maintain bone health” coupled with 1,500 mg of calcium and 800 IU of vitamin D. I am already taking a daily dose of 1,200 mg of calcium and 2,000 IU of vitamin D via supplements. I also drink at least 1 glass of 1% milk daily. I believe these habits will be easy to maintain. Although I seldom attend concerts now, I’m not ruling out the possibility that I might like to see a concert or two at some point in time. I used to think wearing earplugs at concerts was silly considering you are paying to listen to the music. However, now that I know hearing loss is directly related to overexposure to noise, I won’t forego the earplugs. I am already utilizing everything I can to block the sun. In addition to my clothing and sunscreen combo, I also have tinted windows in my car. I have also used an umbrella to shield the sun while walking. To be honest, the hardest part of keeping up with this regiment is the comments I get from people who love the sun. Although I am still figuring out how to navigate through public scrutiny, I find it easy to mention I just came from a funeral (which being a funeral director, this can indeed be the case). I find there are a multitude of problems that can be prevented or corrected through proper lifestyle habits. For instance, “when abnormal lipids are diagnosed, the first recommendation is lifestyle changes: reducing animal fats, increasing dietary fiber, losing weight, exercising more, quitting smoking”. Treatment of high blood pressure follows the same guidelines, though it adds the reduction of salt and alcohol. Interestingly “the most significant reductions in blood pressure are with weight loss”. Although I already try to eat mostly lower fat proteins like ground turkey and baked chicken, I could focus more on only eating low fat proteins. Also, although I already incorporate some fruits and vegetables, I should and could eat more. My main obstacle to fresh produce is purely financial at present. Also, spending time with Naturopathic Doctors has made me question what type of produce and meats to buy. There is a huge push to “buy organic” and although I can’t afford it presently, I am hoping that I will be able to incorporate more organics into my diet over time. I do not believe pesticides, chemicals or added hormones are good fuel for the body. The last component I believe I will need to achieve the best health is to restart exercising on a regular basis. Exercise has so many benefits that it’s inarguable how necessary it is. Although it will still be hard for me to set aside the time to exercise, I am dedicated to doing it. I already have a mini trampoline, elliptical machine and a treadmill (that needs to be fixed) at my home and I look forward to using them regularly. Our health is in our hands in many ways. We must be vigilant and remember that the things we do today will affect tomorrow and all the tomorrows to come. Ferrini. (2008) Health in the Later Years, Fourth Edition. (4th ed.). McGraw Hill.